During the RISE international tech conference , the 2018 China Internet Report was released exclusively on Abacus, a new media platform from the South China Morning Post (SCMP). Covering twelve industries, this hundred-page report summarizes China’s dynamic internetindustry for international readers. China’s internet is now ubiquitous across the country’s industries and population, and it continues to change and grow. 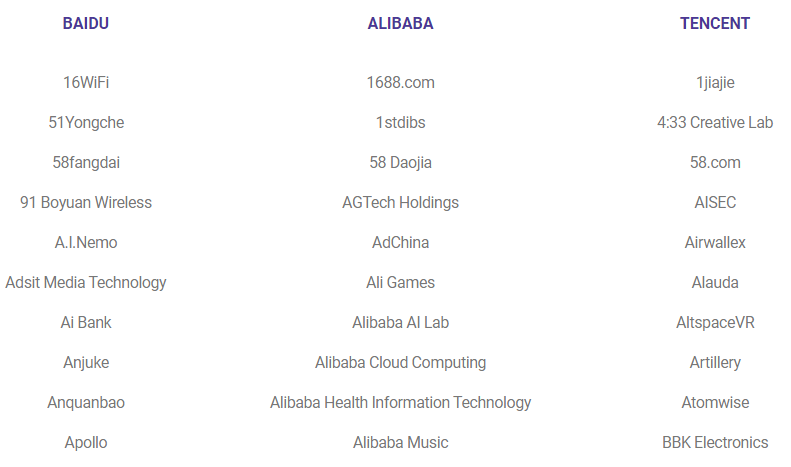 The report includes key information about China’s internet landscape, including lists of Chinese unicorns, the country’s top internet companies and most active investors, and a side by side comparison of the internet population in China and the US. The report begins with a summary of four overarching themes that captures the uniqueness of China’s tech industry growth over the past year. It then delves more deeply into 12 sectors of importance: ecommerce, content & media, social & messaging, sharing economy, artificial intelligence, smart devices, autonomous cars, blockchain, fintech, education, gaming and esports. Chinese internet giants are doing everything: In China, it’s not enough to do one thing well — the internet giants have decided to do everything. BAT (Baidu, Alibaba,Tencent) have exposure to most key sectors by either building in-house or through investment. BAT is also growing beyond the domestic market; combined, the big three have had invested in 150 companies outside of mainland China. Chinese internet companies are playing an important role empowering the country’s next wave of development: 490K online shops are run by rural households and 55M rural students are reachable by live-streaming classes. 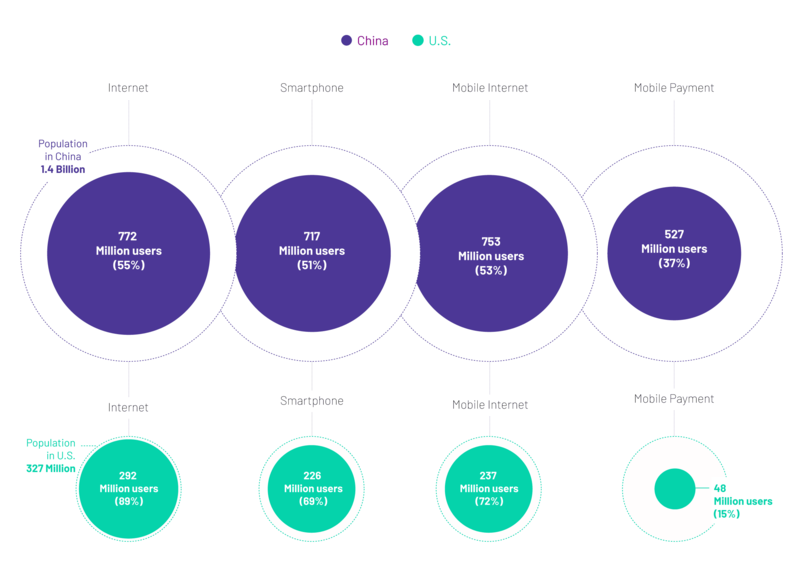 China is a cashless society: China’s total mobile payment transaction volume hit $15 trillion USD in 2017 with the Alibaba-Tencent duopoly dominating 92% of the market. Retail digitization adds new form of O2O: Online grocery is expected to become a $30 billion USD business in 2018; major players like Tencent, JD, and Alibaba are all making significant investments in new forms of online-to-offline (O2O) grocery stores. Short video apps captured the most eyeballs in 2018: Over 230M people in China are actively using Kuaishou, the country’s leading short video app; Douyin, China’s second most popular short video app, was the most downloaded iOS app in Q1 2018 globally, beating out YouTube, WhatsApp, and Facebook. China remains the world’s largest gaming market and is still growing: China captured US$30.8 billion in gaming revenue in 2017, which is more than one-fourth of total global gaming revenue. In China, more than 200M viewers tune in to esports via live streaming each year. Top Chinese game streaming sites each have more active streamers than Twitch has. Artificial intelligence is one of the Chinese government’s key priorities: Autonomous driving, computer vision and voice intelligence are among the areas of focus. Chinese people love cryptocurrencies, but the government doesn’t: A few Chinese cryptocurrencies have reached over $1 billion in market cap. The Chinese government wants to be a front-runner in blockchain technology, but has completely nbanned crypto trading.